The All Blacks are on the march. They move up over the 22. Ben Smith drops a clever kick in behind and Nonu very nearly chases it down but the ball runs into touch. If we lose now the half time full time at the tab (all blacks/Australia) was paying $10. I feel like a traitor but couldn't miss out on that action. Let's hope I lose my money. Nic White drops out for Australia from the 22 and Carter sends one straight back. Toomua eventually clears for the Aussies and the All Blacks decide to try running the ball. Carter shows some midfield magic to nearly open up a gap but Aussie recover. The All Blacks looked dangerous as they spread the ball wide left. 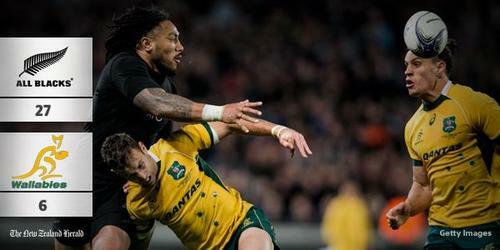 But as the ball went through the hands it was put down by Savea. Aussie have the feed in the scrum and it's a real mess. NZ very nearly turn it over but somehow Aussie hold on to it. WHite's kick was charged down but Aussie recover again. Neither team really penetrating at the moment. The second half has turned into a kick fest. What a try. Milner-Skudder has a quiet first half but he just came alive bigtime. Quade Cooper has been shown a yellow card. The All Blacks have been awarded a penalty try. Milner-Skudder exploded through a gap and somehow found Aaron Smith with an incredible inside pass. Smith was destined to score but was caught with a desperate head high tackle right on the line which made him fall short. Cooper into the bin, Aussie in big trouble. Man, Skudder has got to be in the squad. You also have to have Piutau. I think Dagg and Jane miss out. Aussie need to reply quickly now but it will be tough with just 14 men. They've done it again. Once again Milner-Skudder was at the heart of it. It started with a poor kick from Toomua. Milner-Skudder caught it and showed some quick thinking to quickly kick in behind. 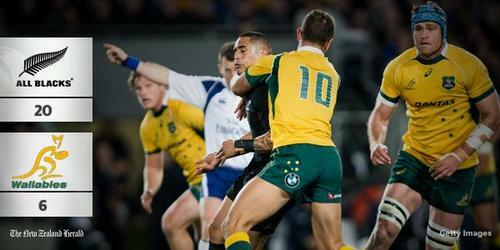 The chase from NZ was a good one and when Ben Smith got to the ball first he spun the ball wide left. NZ had a huge overlap and Nonu ended up running in the ball untouched. 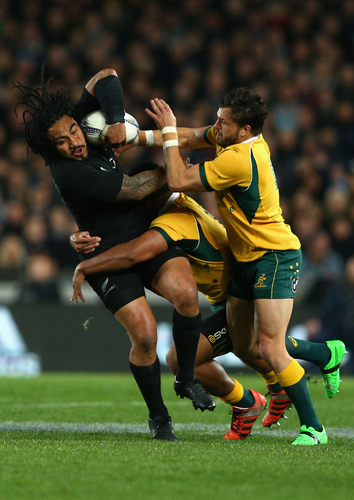 nonu is the best ab tonight. Another penalty against the Wallabies now. It's been a shocking start to the second half for them. 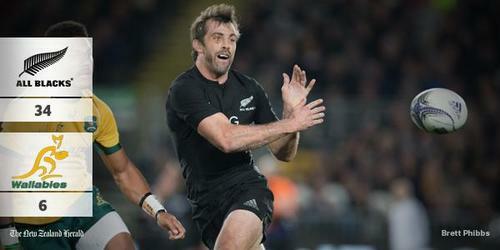 All Blacks on the doorstep once again. Conrad Smith this time scores in the right corner. Nonu broke the line in midfield and the All Blacks finished clinically. It's one way traffic now, this is the All Blacks at their best. How must Quade Cooper be feeling? Chieka is an idiot. His players deserve better. What a moron to pick Cooper. ABs having a huge laugh at that selection. Carter converts and the All Blacks now lead 34-6. The crowds going wild here in Greece, well, me anyway. Poke the bear, the bear wakes up and mails you alive. Just over 20 minutes to go and the Wallabies have won a penalty deep in their own half. Quade Cooper's time is up in the bin but he has been dragged. Kurtley Beale is on.